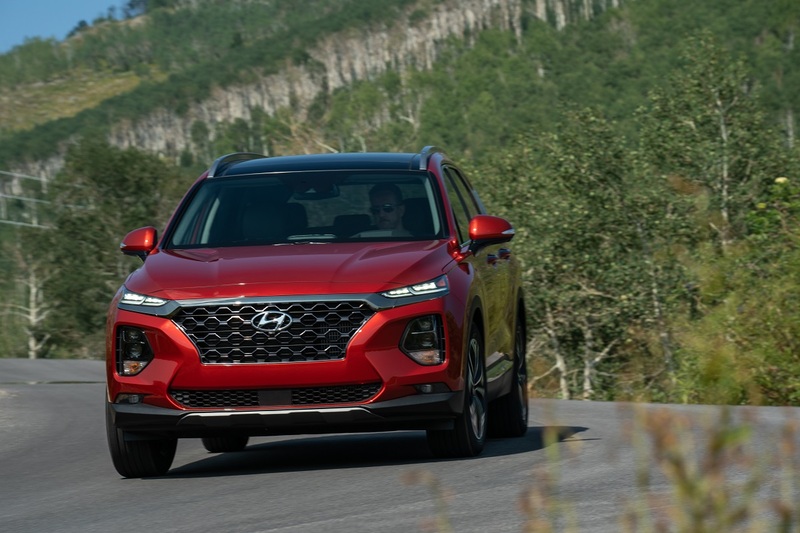 The 2019 Hyundai Santa Fe is all new with updated styling, technology, and features. It also sees a name change that needs a little clarification. The old Santa Fe Sport is now called simply the Santa Fe. 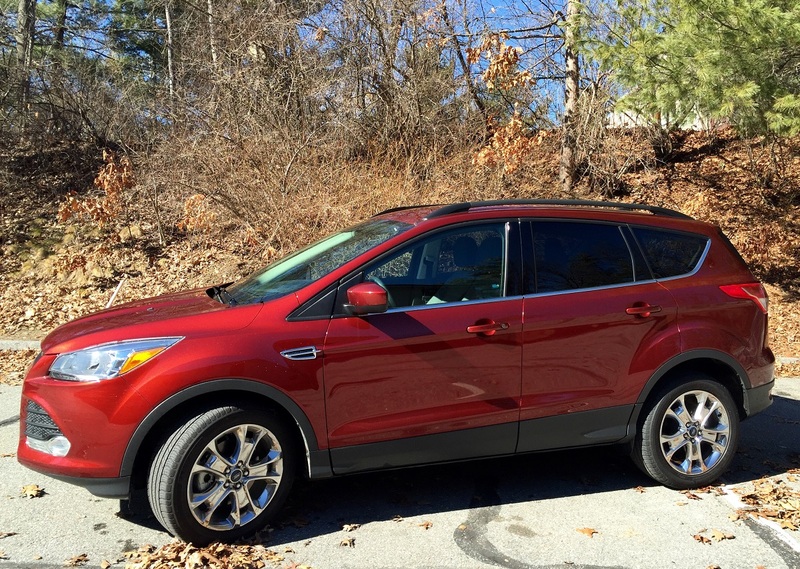 This is a two-row SUV with room for five passengers. 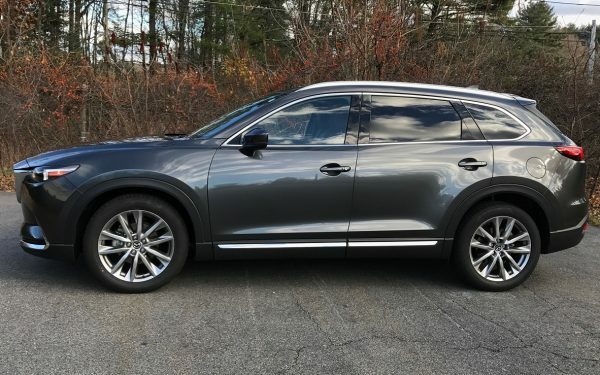 If you’re looking for the three-row version with room for seven passengers, that’s now called the Santa Fe XL. 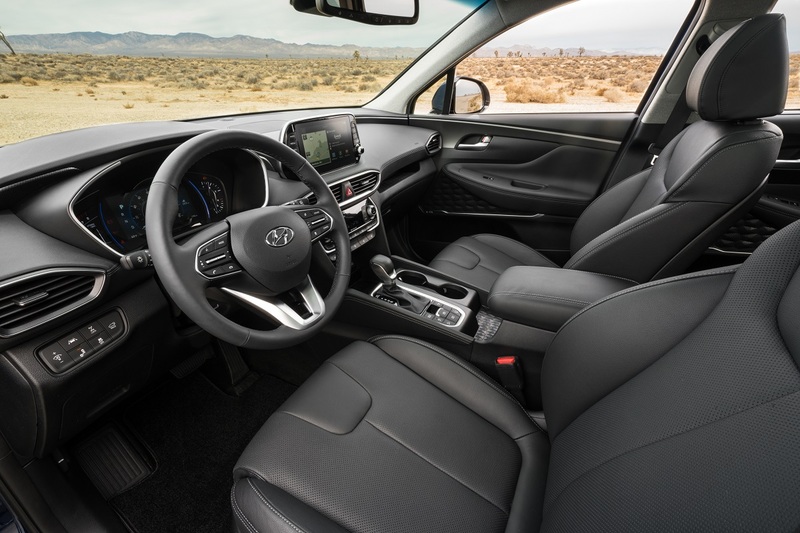 We spent some time with the Santa Fe with its two rows of seating and roomy interior that comfortably seats five passengers. 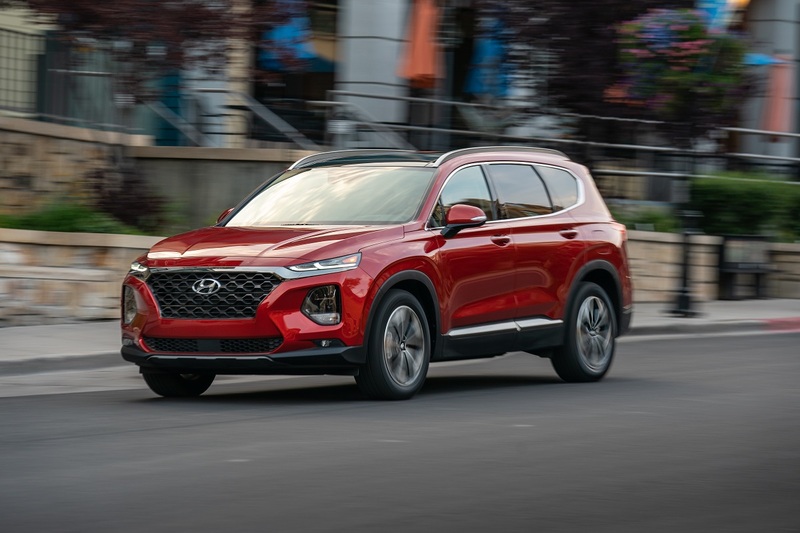 Hyundai is not a premium brand – see the new luxury Genesis brand if you want a more upscale choice – but the Santa Fe feels and looks far from an economy choice. Material qualities are good even in the base trims while higher trims get features including leather seating surfaces, heated and ventilated front seats, heated rear seats, and an 8-way power driver’s seat with 4-way lumbar. It’s spacious and attractive making it a welcome place to pass the time on that family road trip. Looking for a new or used Hyundai Santa Fe? Check out BestRide’s listings search here. Loaded with a full crew of passengers, there’s 35.9 cubic feet behind the second row, which is plenty of room for luggage. 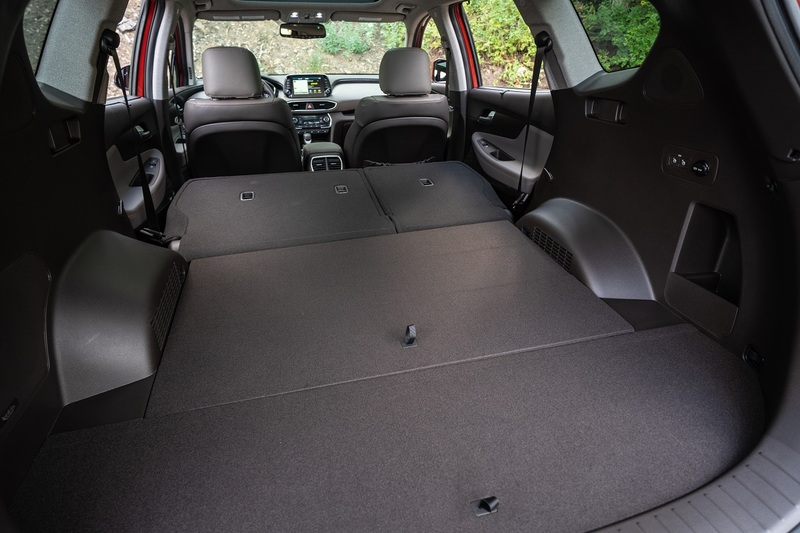 Fold the second row down and cargo capacity increases to an expansive 71.3 cubic feet. The Santa Fe can even tow up to 3,500 pounds when properly equipped. A choice of two powertrains are both paired to an 8-seed automatic transmission. Base models have a 2.4-liter 4-cylinder with 185 horsepower and 178 lb-ft of torque. Top trims get a 2.0-liter turbocharged 4-cylinder with 235 horsepower and 260 lb-ft of torque. That’s a big difference and you’ll feel it when you press on the gas. If you’re looking for a more responsive ride, then go with the turbo. Making that family road trip easier is good fuel economy. 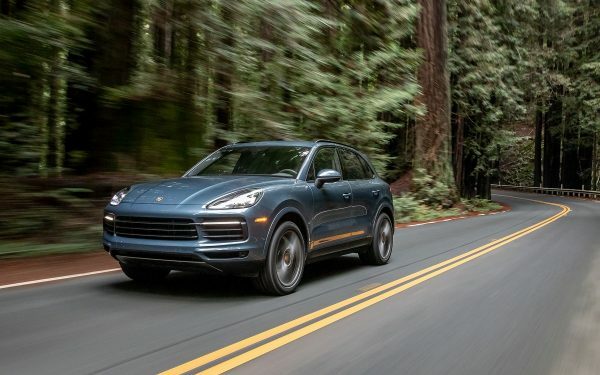 Front wheel drive models get an EPA-estimated 22 mpg in the city, 29 mpg on the highway, and 25 mpg combined with the 2.4-liter engine or 20 mpg in the city, 25 mpg on the highway, and 22 mpg combined with the turbocharged engine. Choose all-wheel drive and the 2.4-liter engine gets an EPA-estimated 21 mpg in the city, 27 mpg on the highway, and 23 mpg combined while turbocharged models get 19 mpg in the city, 24 mpg on the highway, and 21 mpg combined. The ride in the turbo is smooth and quiet with minimal road and wind noise. The engine, too, is nicely muted under all but the hardest acceleration. A heavy foot on the gas easily gets the Santa Fe up to highway speed and provides the extra power you need for highway passing. The Santa Fe handles well with controlled steering that makes it easy to pilot this SUV down the road. Base models get a 7-inch display screen with Apple CarPlay and Android Auto while top trims get an 8-inch touchscreen with navigation and a surround view monitor. There’s also wireless charging for compatible devices. While the larger screen is a bonus, even the smaller screen isn’t so small that it’s a challenge to manage. 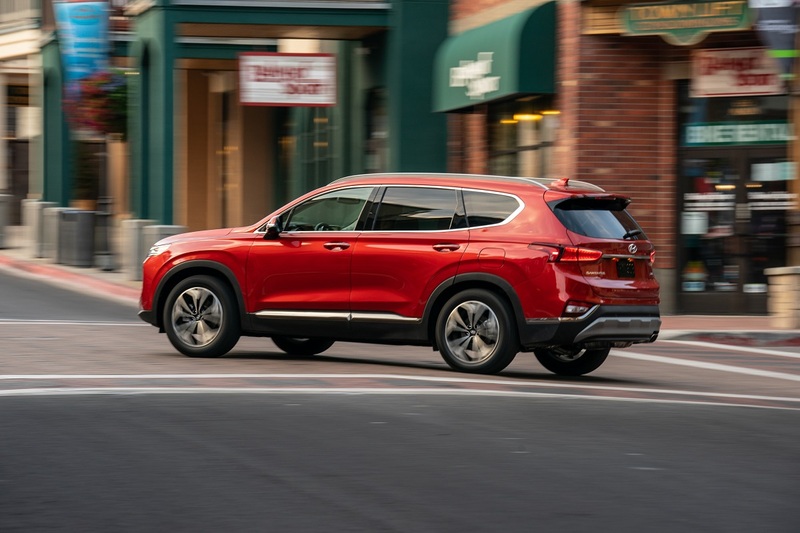 The Santa Fe comes with a wide range of standard safety including forward collision avoidance assist with pedestrian detection, driver attention warning, blind spot warning, lane keep assist, and rear cross-traffic warning. It also did very well in crash tests. It’s an Insurance Institute for Highway Safety 2019 Top Safety Pick+ and it received an overall 5-star rating from the National Highway Traffic Safety Administration.